Pete Cooper's course is dedicated to introducing fiddlers to the wonderful repertoire of traditional airs and dance tunes. You don't need previous experience of folk fiddling, but you do need to be of at least intermediate standard and to be game for the challenge of learning a range of jigs, reels, hornpipes, strathspeys and so on, all by ear! Pete will also teach you how to bow and finger them in the traditional way and will give you legal copies of the written notes to take away at the end of the course. 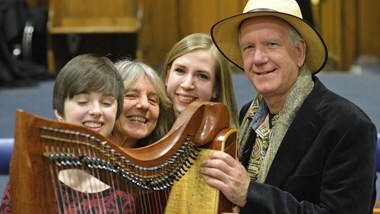 We will also be joining the Clarsach course on the Saturday evening for an impromptu ceilidh.